This is not exactly trying to see how many co-eds can pile into a Volkswagen Beetle, but this is still amazing. (Boxun) 81 Students Pack Into One Unbelievably Crowded Classroom. September 7, 2006. A classroom built for 45 people accomodates 81 students. because there are so many students in each class. lectern and less than one meter away from the blackboard. in order to exit the classroom. In this second grade class, eighty-one students are packed into a room about 50 square meters in area. How crowded is it? In the front of the classrooms, the desks are even closer to the blackboard than the lectern, at less than one meter away. In the rear, the students sit up against the backwall. The backdoor of the classroom cannot be opened. There are nine rows of benches, with very little space in between. It is difficult to get out to use the restroom during class time. When school is over, the students climb over the desk to get out. 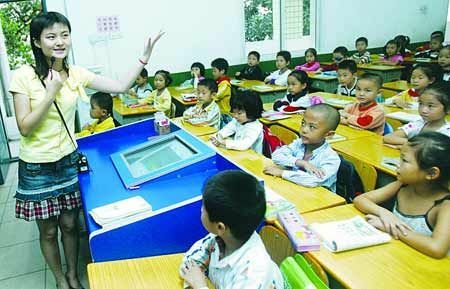 Due to a large influx of the children of migrant workers, Changsha city Yuhua district's designated school to receive migrant children is so packed that it cannot receive another desk. Similar situations are occurring in other districts. Not only are the schools for migrant children overcrowded, but the same thing is happening in the elementary schools in the newly constructed residential areas next to the old city. One of the reasons for the crowding is the number of children who were born in 2000. There is a limited amount of space, and the districts with the newly constructed housing did not build schools for the families that are moving in. So you have the embarrassing situation of "parents who are smiling to move into their new homes and crying to find schools for their children." 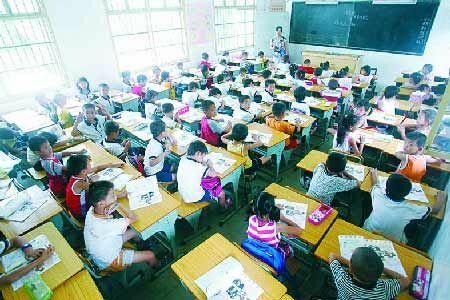 The large class sizes make parents worry about the health of their children: when so many children are packed into a single classroom, its gets "smelly" during the summer and the air is turbid when the windows are closed in the cold winter. Meanwhile, influenza and others viruses get passed around among the students. 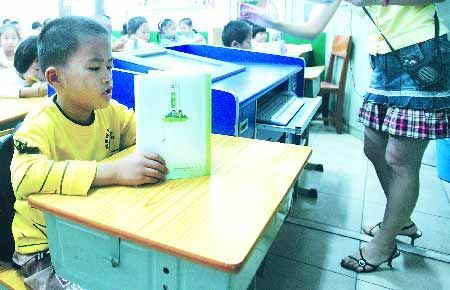 In certain Changsha schools, they have cancelled physical exercises for the students due to the lack of space. In order to satisfied the qualified students, Yuhuating Elementary School has turned the recently completed art room into another classroom. "This year, we took out the art room to deal with the emergency. What will we do next year? Take out the computer room?" said the school principal.